It is going to happen and likely happen more than once; you will be performing a trick and mess up, either getting it wrong or accidentally exposing the secret. What do you do? The first rule of any bad situation is to not panic - if you panic you make it harder to think and more likely to further botch the situation. In some cases the audience may not know you messed up on the trick. Say you are doing a card trick and planned on finding the spectator card using a key card, and forgot the key card - at this point you know you blew it, but the audience is still waiting for you to find their card. Being able to turn the trick around at this point means it is as if you never messed up at all. If you mess up, relax - the audience is not out to get you and every one of them has messed up on something before. They are human and so are you, so don’t panic, just work it through. The magician appeals to the audience firstly by not panicking (it is that important that it had to be repeated) - a twitchy, scared magician isn’t much fun. A magician that can turn a mishap into a comedic moment is sometimes more fun than a magician that performs flawlessly. As anyone who has tried comedy can tell you, being funny requires a great deal of self confidence and you can’t be self confident if you are chastising yourself and imaging the audience is about to boo you off the stage. A ready smile, a “Wow, did I mess that up! Let’s try it again” and quickly moving past the mess up is the best way to go - your audience WANTS you to succeed and is happy to forgive you your mishaps. In the case of the card trick above, being able to transition right into another trick is a life saver. Even if you can’t pull it off without letting the audience in on the fact that you messed up, move right into another trick. It is perfectly acceptable to restart the same trick, as long as you have “appealed to the audience”, or even toss that trick and go on to another one. Keep things moving and your audience will be happy. 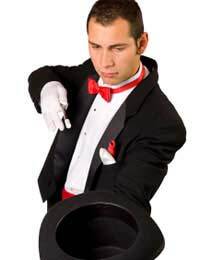 Some entire routines are actually based on the concept of a bungling magician that can’t make a trick work to save his life. In reality that magician is appearing to mess up, but it is all misdirection as he performs some other bit of unsuspecting, but amazing, magic. Even if you don’t have a routine built around this idea you can borrow from it off the cuff when required. You have messed up - Don’t Panic! Appeal to the audience and have another trick ready to go and you will do fine. One last thought - this show you are doing now, when you mess up, is not the only show you will ever do. Take your mix up as a learning experience, go back to training and figure out how you can avoid making the same mistake a second time.